Report produced in 1989 for Dornoch Heritage Society by W.C. (Bill) Wright, Rinnes, 4 The Pillars, Dornoch, on the Sutherland Field Club papers. One typed sheet with some hand-written amendments and additions and four hand-written sheets, one each for the years 1879 to 1882. 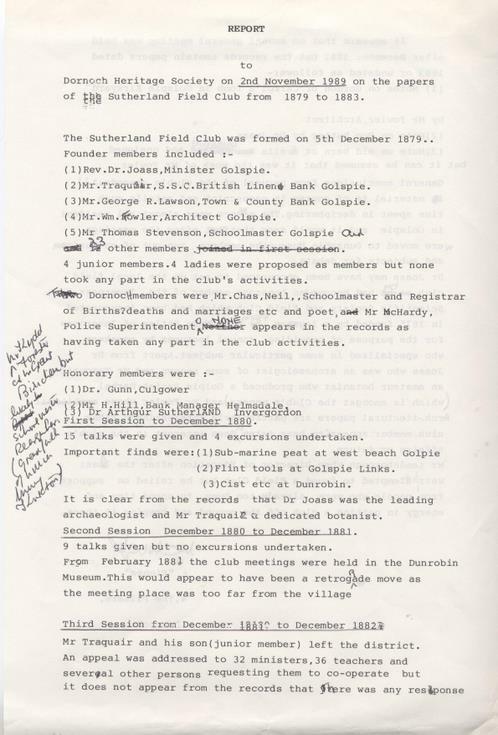 The report maps out a rough chronology of the Field Club's activities, and lists the members and the main subjects they researched or reported on. The founder members, who included Rev Dr Joass, were all from Golspie.